There is something awe-inspiring about heights. Whether it is the tallest building, the largest drop or the grandest mountain, mankind finds them all very impressive. So what better way to gain a new perspective or appreciation for a place than from on high? Not content with just constructing the tallest structure on the planet Gustave Eiffel even created his own tiny apartment near the top of the Eiffel Tower in Paris. As well as soaking up the praise for his ingenuity, he also became the envy of the Parisian elite. Perched nearly 1,000ft above the city he was able to host world luminaries including Thomas Edison and offer a totally new perspective on the city. Never has there been so much pressure not to lose a ball than during a round of golf at the Over The Top golf course. 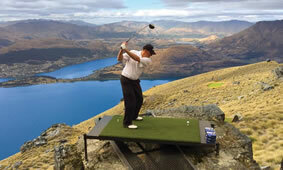 Perched at 4,500ft in the Southern Alps of New Zealand this is a unique par 3 golf course overlooking Queenstown. With helicopter access only, players will fly in, drive, chip, and putt out on the top. Surrounded by towering mountains and high country tussock with Queenstown and the aqua-blue Lake Wakatipu below, this is one of the most picturesque courses in the world. Could there be a better place to rediscover golf or gain a new perspective on New Zealand? While yogis of past have tried to levitate to higher levels, Yogasphere in London are bringing you a place in the sky to practice yoga. Classes in the tallest building in Europe, The Shard at 1,016ft, are the highest regular yoga classes in the world. These are the perfect way to master yoga asanas quite literally amongst the clouds, bringing a new perspective to an ancient practice and to London itself. Contact us if you are ready to reach new heights and gain new perspectives.